What are the key principles of Lean product development? Here are seven, that if applied correctly, can transform your product development process. With decentralized planning, the people who actually do the work participate in the planning. This ensures the plans are more accurate and creates buy-in from the team members. What is a shared project buffer? 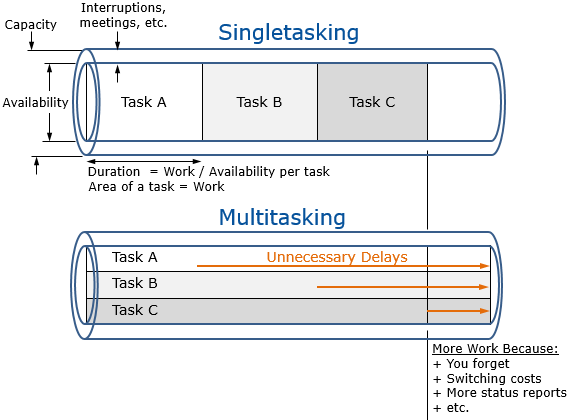 To accommodate for the uncertainty in the work estimates and the resource's availability to do the work, the artificial, invisible task buffers are replaced with a shared team buffer at the end. The published completion date (promise date) is at the end of the shared team buffer. A daily standup is a daily, 15-min long, meeting where each person spends a few minutes preparing, a few minutes discussing what’s blocking their progress, a few minutes getting up to speed with the rest of the team’s progress and blockages – every single day. On the occasion a team member learns something that effects their work, they learn about it soon enough make a change (fast feedback). Daily standup meetings keep the team motivated, focused, and working on the right things at the right time. Imagine if every time we went to a store, for example, the local grocery store, the cashiers multitasked? If, on average, there are 3 people in line at a time, our average check out time would triple, from 5 minutes to 15 minutes: and that is before adding the switching costs. With twenty people in line, every hour a shopper spends in line in normal 'pull mode' would become a whole day in 'push mode'. Black Friday would need to be renamed Black Friday, Saturday, and Sunday. The first person in line really gets delayed, and the last one is also delayed because of all of the wasted time spent switching between everyone in front of him. Everyone would be frustrated – the shoppers, the cashiers, and the managers. In a typical, push-based development systems, the work in the system is very difficult to see without some form of Visual Work Management tools. The result is that the resources are overloaded and multitask, and the durations of their tasks are unnecessarily extended. Instead of the ‘single piece flow’ as demonstrated by the cashier example, we have multitasking as depicted in the image below. What is a queue? A queue in product development is the duration of time when something is ready to be worked on, but is waiting for someone to work on it, is called “wait time” or “queue time.” The duration between starting a task and completing a task is called “execute time.” In traditional product development, wait time is typically much greater than execute time. 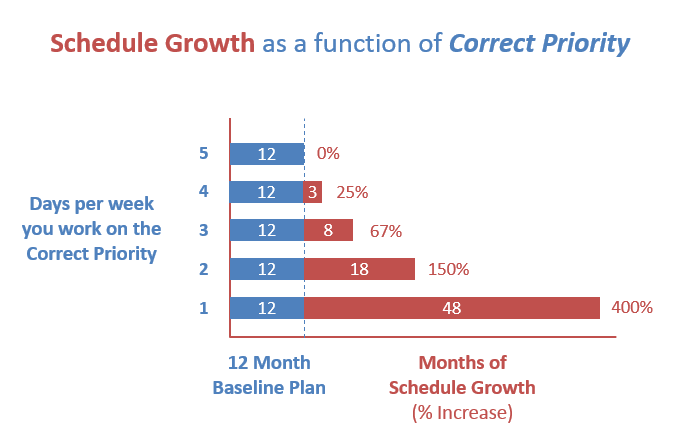 Minimizing wait time is critical to keeping the project moving forward. But how do you see the work when it's knowledge work. That's why in product development, having a visual work management tool like Playbook is critical to creating flow and ultimately, the success of your project. Only when all of the work in the system becomes visible can you begin to manage it. And systems loaded to high capacity states have very long cycle times. However, by managing WIP (work in progress) you can reduce loading and keep the active work flowing much faster. And you can see and monitor it at the daily meetings.